Jamestown Settlement and the American Revolution Museum at Yorktown are open 9 a.m. to 5 p.m. daily (until 6 p.m. June 15 through August 15). Closed Christmas and New Year’s day. 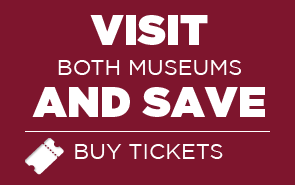 For information about the museums, call (888) 593-4682 toll-free or (757) 253-4838. Jamestown, Williamsburg and Yorktown form “Virginia’s Historic Triangle,” all linked by the scenic Colonial Parkway, and are easily reached via interstates 95 and 64 and U.S. Route 17. Follow these signs for directions to Jamestown Settlement and the American Revolution Museum at Yorktown. Jamestown Settlement is located on Route 31 South, adjacent to Historic Jamestowne, just 10 minutes from the restored area of Williamsburg, Va. From Richmond, take I-64 to Exit 234 (Lightfoot). Turn right onto Route 199. Follow Route 199 for eight miles and turn right at the second traffic light onto Jamestown Road (Route 31 South).From Hampton Roads, take I-64 west to Exit 242A. Follow Route 199 for five miles. Turn left at the fourth traffic light onto Jamestown Road. 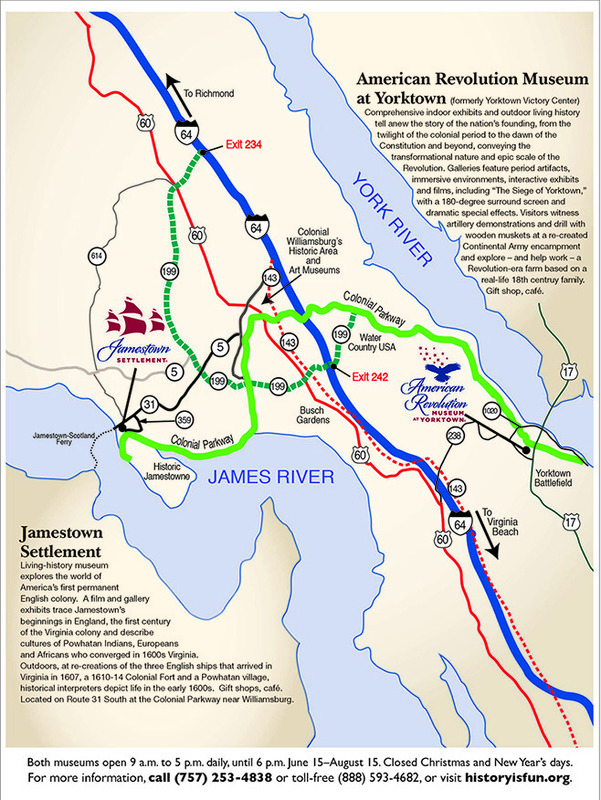 All: Drive four miles on Jamestown Road, and turn left at the Jamestown Settlement sign, onto Route 359. Turn right into the museum parking lot. Parking is free at Jamestown Settlement. The American Revolution Museum at Yorktown is located on Route 1020, at the edge of Yorktown and near Yorktown Battlefield, just 20 minutes from the restored area of Williamsburg, VA. From Richmond, take I-64 to Exit 247. Turn left onto Route 143. Turn left at the first traffic light, onto Route 238. From Hampton Roads, take I-64 west to Exit 247. Turn right onto Route 238 toward Yorktown. All: Follow Route 238 for three miles, then bear to the left onto Route 1020. The American Revolution Museum at Yorktown is one mile on the right. Parking is free at the American Revolution Museum at Yorktown. The distance between the two museums is approximately 20 miles. For around the clock traffic and travel information on Virginia’s interstates, visit http://www.511virginia.org/. The Virginia 511 system updates callers and Web site visitors with information about road construction, traffic and weather conditions, traffic incidents, transit information, lodging, food, gas and more. The service is available 24 hours a day by dialing 5-1-1 or by visiting www.511Virginia.org. Outside Virginia, 511 Virginia can be accessed by calling 1-800-578-4111. Hearing impaired users (TDD users) can call 711 and ask to be connected to 511.